Lexington, KY – The United States Equestrian Federation (USEF) has named the following horse/rider combinations to represent the United States on the first USEF Tour of the Meydan FEI Nations Cup Series. These horse/rider combinations were selected based on the Friday, April 1, 2011 Rolex/USEF Show Jumping Ranking List. The second round clear jumped by Emilie Martinsen and Caballero helped Denmark to victory in the Meydan FEI Nations Cup Promotional League Final in Barcelona, Spain today. Photo: Nacho Olano. Barcelona, 19 September 2010 – Denmark will join the elite group of countries in the 2011 Meydan FEI Nations Cup series following a clear-cut victory in the Meydan FEI Nations Cup Promotional League Final at the Real Club de Polo in Barcelona, Spain today. The 5-Star Spanish fixture was dogged by appalling weather conditions which led to the transfer of several of the classes from the main arena to the sand-ring located behind the stables, and riders today faced the unusual task of jumping their two Nations Cup rounds over two different courses in two different arenas. But nothing could throw the Danish contingent off their stride and, boldly leading the way at the halfway stage, they stood firm to confidently earn their place in the top-level series next season. At the Draw for the last leg of the 2010 Meydan FEI Nations Cup in Dublin today were (L to R) : John Roche, FEI Director Jumping; Paul McAuley, General Manager Emirates Equesrian Centre for Meydan: Pat Hanly, Show Director Dublin Horse Show. Photo Credit: Tony Parkes. Dublin (IRL), 5 August 2010 – The French, who cannot be beaten for the 2010 Meydan FEI Nations Cup title, will be first into the ring for the final leg of the series at the Royal Dublin Society Showgrounds in Dublin, Ireland tomorrow. 1, France; 2, Great Britain; 3, Sweden; 4, USA; 5, Ireland; 6, Germany; 7, Netherlands; 8, Switzerland; 9, Spain. With their last-to-go draw, the Spanish are in with a chance of holding on to their place in the series for 2011. Lying sixth on the leaderboard going into this final clash, the country which only joined the top-league series for the first time this year is in danger of being overtaken by The Netherlands, Sweden and Switzerland who are all currently situation in the bottom-four relegation zone in the 10-nation series. A bad day for Spain tomorrow could prove very expensive, but team manager Marco Fuste is thinking positive. “We have our best team possible here – it’s tough, and we are going to have to fight hard tomorrow, but we are expecting a good result and I am very happy with our place in the draw,” he pointed out. Hickstead (GBR), 27 July 2010 – The pressure is intense ahead of this Friday’s seventh leg of the 2010 Meydan FEI Nations Cup series in Hickstead. The Sussex venue has staged the British Nations Cup since taking on the mantle of the Royal International Horse Show in 1992, but the atmosphere is expected to be more highly-charged than ever before as the top show jumping nations in the world battle it out for the right to remain amongst the elite in their sport. This season’s Meydan FEI Nations Cup series has turned into an epic battle, because four of the 10 competing countries will be relegated to the Promotional League following the last leg in Dublin next week. After six of the eight competitions have been completed it could hardly be a closer-fought affair, and this Friday’s penultimate clash will be pivotal in deciding who stays in and who goes out. One country that is definitely destined to say farewell to superleague jumping in 2011 however is Poland. With no points accumulated after six courageous competitive efforts, and now unable to field a team, they have withdrawn from both Hickstead and the final leg in Dublin. 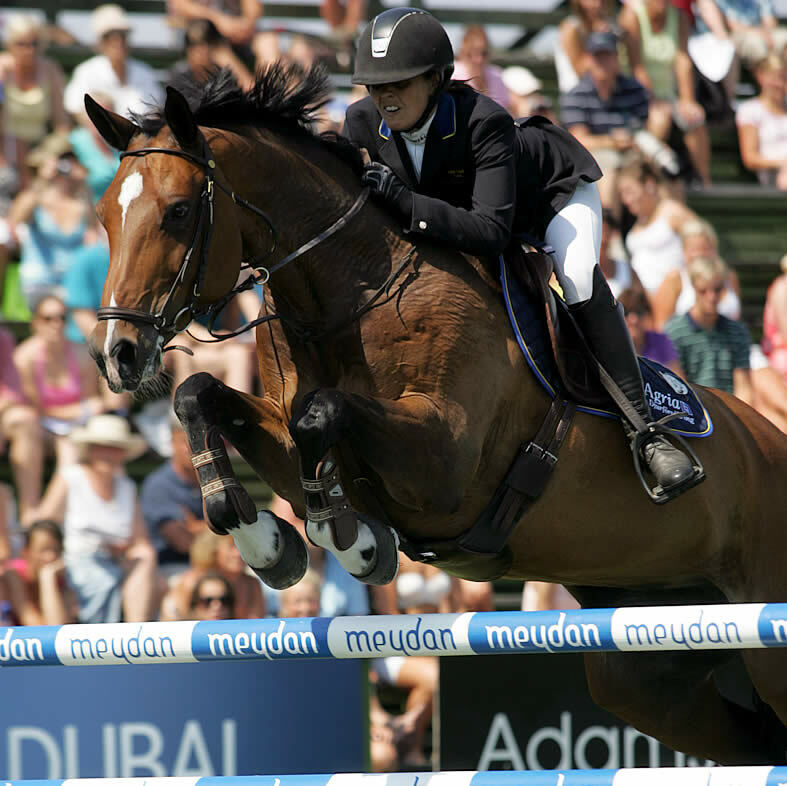 Rotterdam (NED), 18 June – The all-female US team stormed to victory at the fourth leg of the 2010 Meydan FEI Nations Cup in Rotterdam today where, for the first time this season, the French did not have their way and had to settle for equal-fifth place. There was an air of determination about the winning side from the start, and with three double-clears they proved untouchable. Great Britain’s march back to the top end of the sport continued as they slotted into runner-up spot with a one-fault advantage over the third-place home team, and there was huge relief for Dutch Chef d’Equipe Rob Ehrens. “Today was so much better,” he said as, at last, his riders managed to shake off the run of poor results that has left them lingering in the bottom-four relegation zone for the last few weeks. They have only moved up one place on the leaderboard however and still remain extremely vulnerable along with Switzerland, Sweden and Poland. CAN THE FRENCH MAKE IT A FABULOUS FOUR? Rotterdam (NED), 15 June 2010 – As the 2010 Meydan FEI Nations Cup series reaches the half-way stage at Rotterdam in The Netherlands this Friday, the big question on everyone’s lips is, “Can the runaway French be stopped in their tracks?” The defending series champions have a commanding advantage at the top of the 2010 leaderboard after their hat-trick of victories at La Baule (FRA), Rome (ITA) and St Gallen (SUI) over the last four weeks, and Chef d’Equipe Laurent Elias is taking no chances with another crack side for this latest fixture. The French are also the defending champions at Rotterdam where Penelope Leprevost was the heroine in 2009 when clinching the honours in a thrilling third-round head-to-head against America’s McLain Ward. The lady from Normandy has firmly established herself as a linchpin of her national side since then, and is again selected for this week’s event alongside Kevin Staut, Patrice Deleveau, Michel Robert and Marie Etter Pellegrin. Olivier Guillon and Lord de Theize were members of the French team that secured a third consecutive victory in the 2010 Meydan FEI Nations Cup at St Gallen, Switzerland today. Photo: Valeria Struen. St Gallen (SUI), 4 June 2010 – The French team, already leading the series by a considerable margin following their double of wins over the first two legs, swept to victory again today in the third leg of the 2010 Meydan FEI Nations Cup at St Gallen, Switzerland. The competition came down to a two-way battle in the closing stages between the eventual winners and the crack German side that was sent out to ensure an improved position on the leaderboard. But once again the winners were in a league of their own. They established the advantage in the first round and held firm to clinch maximum points, while Germany finished second ahead of Great Britain in third and Ireland in fourth place. The home team had to settle for fifth when things did not go their way, and the Spanish slotted into sixth ahead of the USA. The Netherlands finished eighth, and this result has now dropped them down to second-last on the leaderboard, so they are in serious trouble going into their home leg in Rotterdam in two weeks time. FEI TV – Go to www.feitv.org for live coverage, event reports, highlights programmes and interviews. 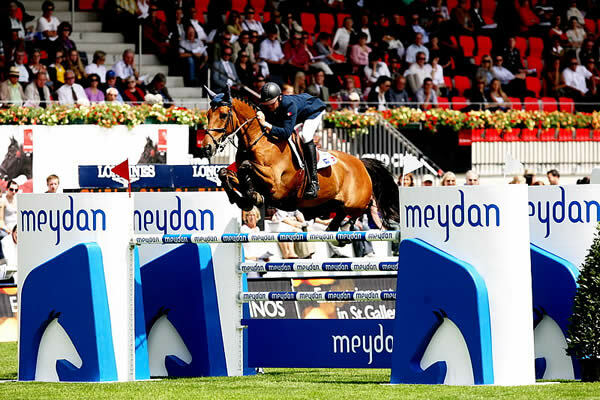 Rome, 28 May 2010 – The French team forged further ahead on the 2010 Meydan FEI Nations Cup leaderboard with a supremely confident second successive victory in Rome, Italy today. In a contest that included the Italian team who were not challenging for points as they are ineligible for this year’s Meydan series, it was the British who lined up second ahead of Ireland and Spain in equal-third. Germany finished fifth ahead of the USA in sixth while Italy claimed seventh spot, Switzerland finished eighth and the Swedish team was ninth. Once again The Netherlands and Poland enjoyed a short afternoon as neither qualified for the second round of competition, and, in an alarming turn of events for the reigning World Champions from Holland, they are now languishing at the very bottom of the leaderboard along with the rookie Polish side and in grave danger of losing their elevated status as Meydan series contenders.